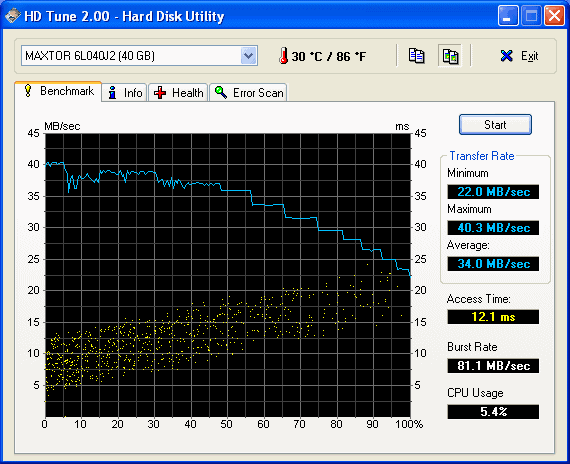 HD Tune is a hard disk utility that includes drive info, benchmarking, and drive health. Information includes partitions, firmware version, serial number, etc. while benchmarking covers transfer rate, access time, burst rate, and more. Health parameters include the S.M.A.R.T details as well as temperature and a whole disk surface scan. Functional with SSD and flash memory. Note: this is the last freeware version. A "pro" version with additional features is available from the website. not listed on the HDTune website afaik. Neither HDTune 2.53, nor HDTune Pro 3.50 ever detected the SMART parameters of my internal laptop drive (a Hitachi HTS721060G9SA00). HDDScan and CrystalDiskInfo detected them fine. Very nice little program. Swiss army knife of HD software. I was worried that this program writes to the registry (HKLM\HDTune), but you can avoid this by NEVER changing the default options/configurations. You can look at the options, just DO NOT click OK. There are very few options anyways and the default options are fine. The only registry entries left will be the regular entries for recently used documents, recent files, MRU, etc. But these cannot be avoided because they are Microsoft generated. Cpu usage reported is very high compared to HD Tach (3.0.1.0, something is clearly wrong with HD Tune (2.52).